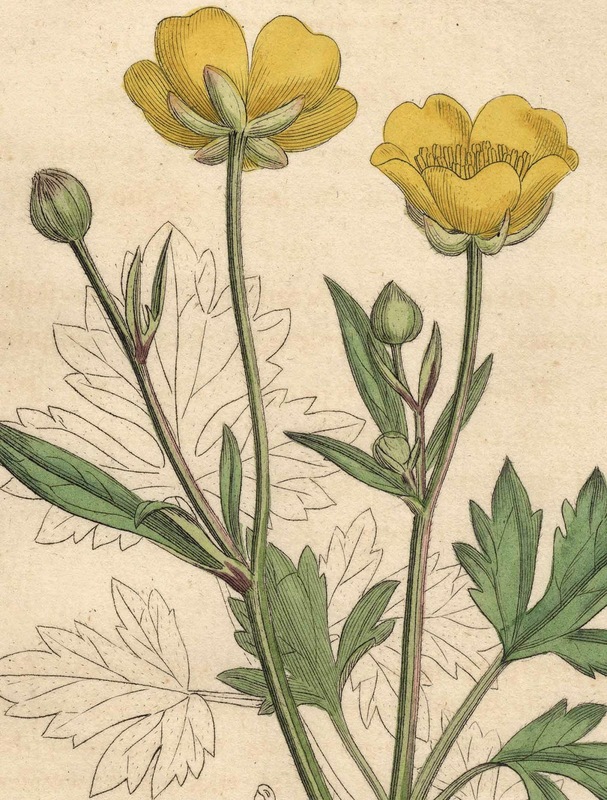 What are some principles that can be applied to botanical illustration to give images pictorial vitality: a spark of life? communicate meaning through visual relationships within the image. 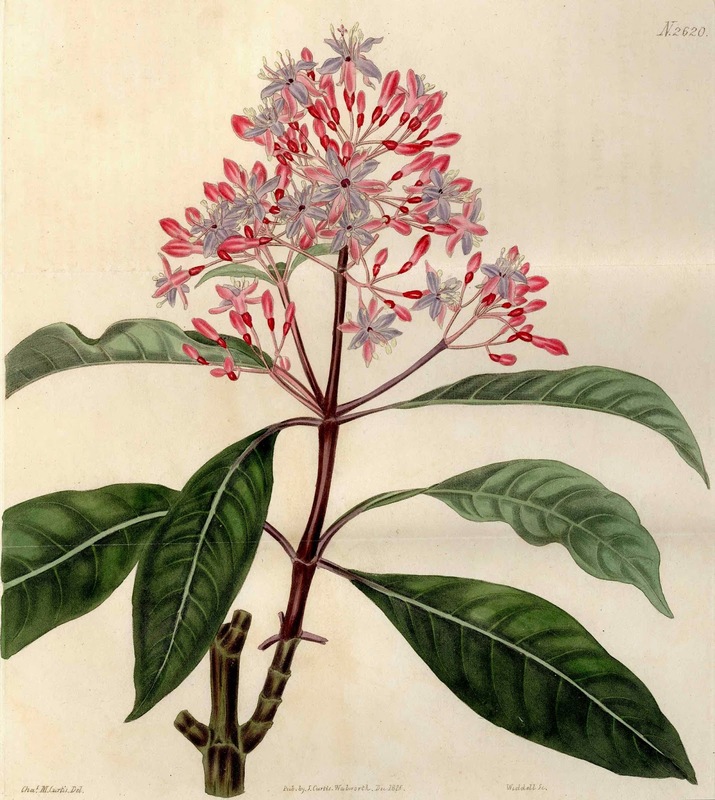 To illustrate the importance of the first of these dot-points, I will compare two very similar gatefold engravings (both shown below) by H. Weddell: Fuchsia (Plate 2620) and Hellebore Leaved Calanthe (Plate 2615), both published by S. Curtis in 1826 for the Botanical Magazine—commonly known as, Curtis's Botanical Magazine (see http://en.wikipedia.org/wiki/Curtis's_Botanical_Magazine [viewed 2 May 2014]). 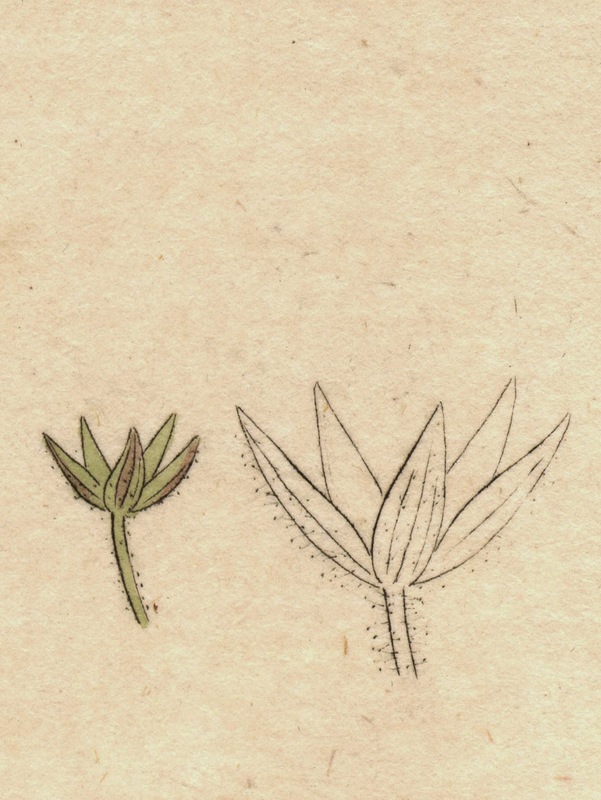 (see illustration: http://www.plantillustrations.org/artist.php?id_artist=371&lay_out=1&hd=0 [viewed 2 May 2014]). Condition: marvellous impression with superb colour in near pristine condition (i.e. the colour has not faded and there is no sign of foxing, bumps or tears). 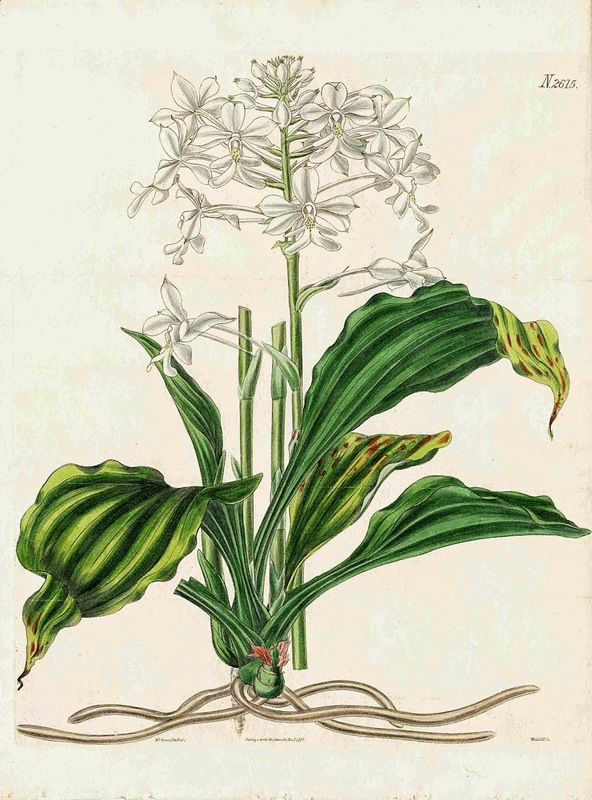 I am selling this print and Weddell’s Hellebore Leaved Calanthe (shown further below) for a total cost of $123 AUD including postage and handling to anywhere in the world. Please contact me using the email link at the top of the page if you have any queries or click the “Buy Now” button below. 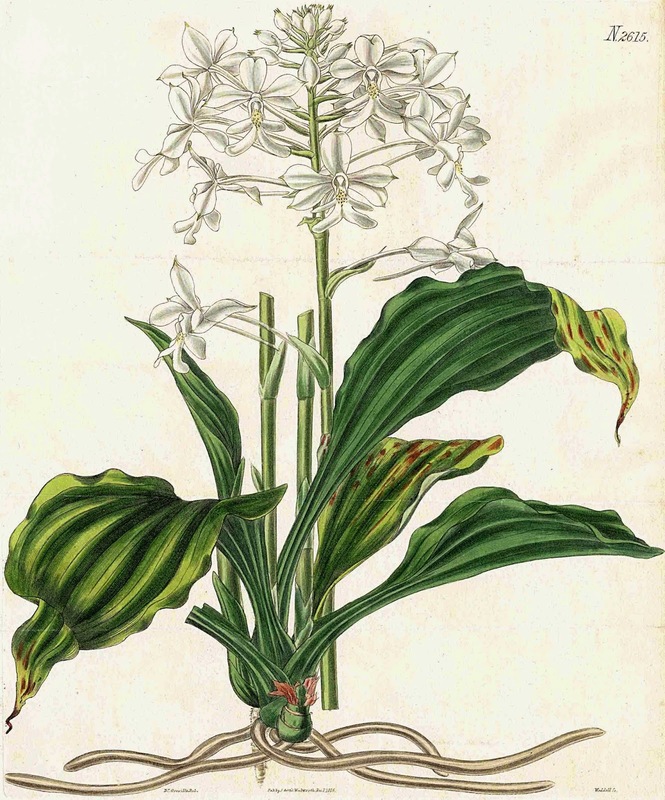 (see illustration: http://www.plantillustrations.org/illustration.php?id_illustration=9630 and http://www.panteek.com/CurtisDoubles2/pages/CBM2615-271.htm [viewed 4 May 2014]). Condition: marvellous impression with superb colour in near pristine condition. 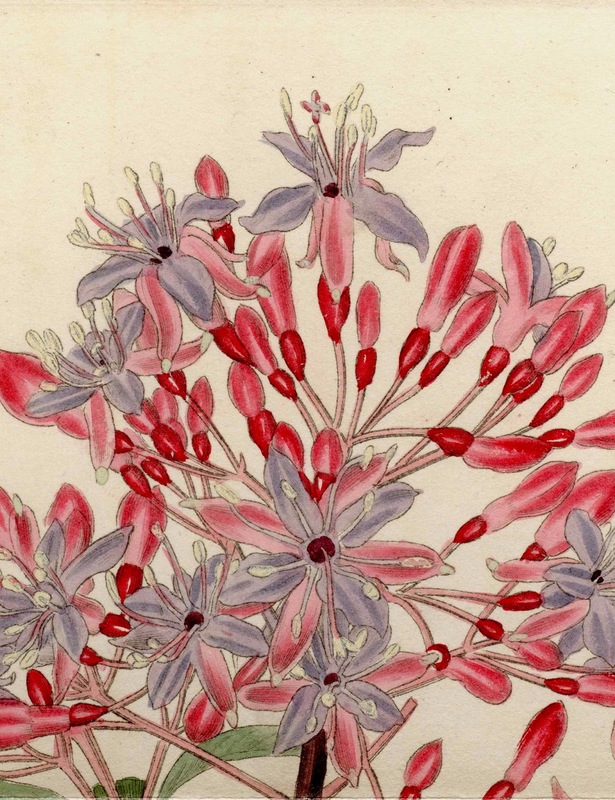 I am selling this print and Weddell’s Fuchsia (shown above) for a total cost of $123 AUD including postage and handling to anywhere in the world. Please contact me using the email link at the top of the page if you have any queries or click the “Buy Now” button above. 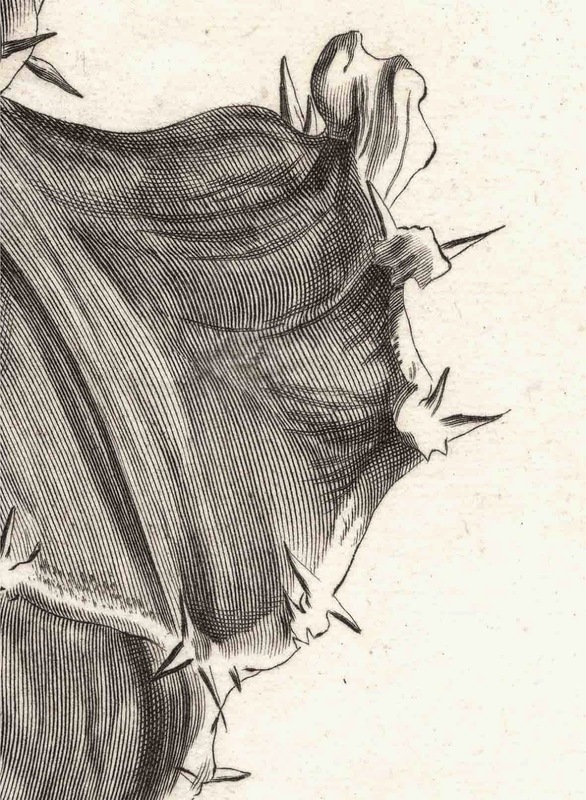 Regarding the first dot-point—to catch/“hook” a viewer’s attention—both engravings are arresting to the eye because the hand-colouring is as saturated in hue as flowers are in reality. There is, however, a subtle principle at play in the formatting (i.e. the pictorial framing) of Fuchsia that arrests the eye more than the formatting of Hellebore-Leaved Calanthe. This principle is simple but effective in giving a spark of life that attracts the eye: cropping (i.e. cutting) the subject at the format edge. 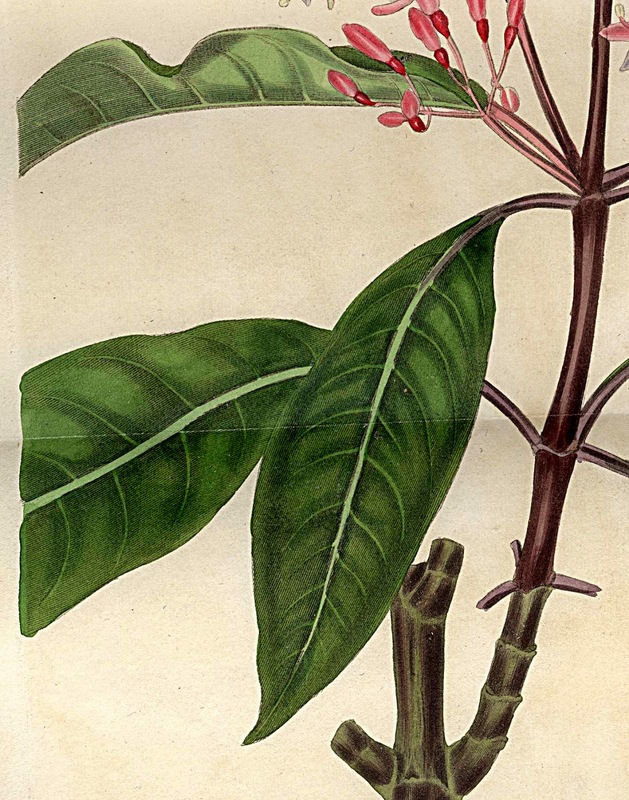 By this I mean that in Fuchsia the leaves are pictorially cropped at the edge of the image. 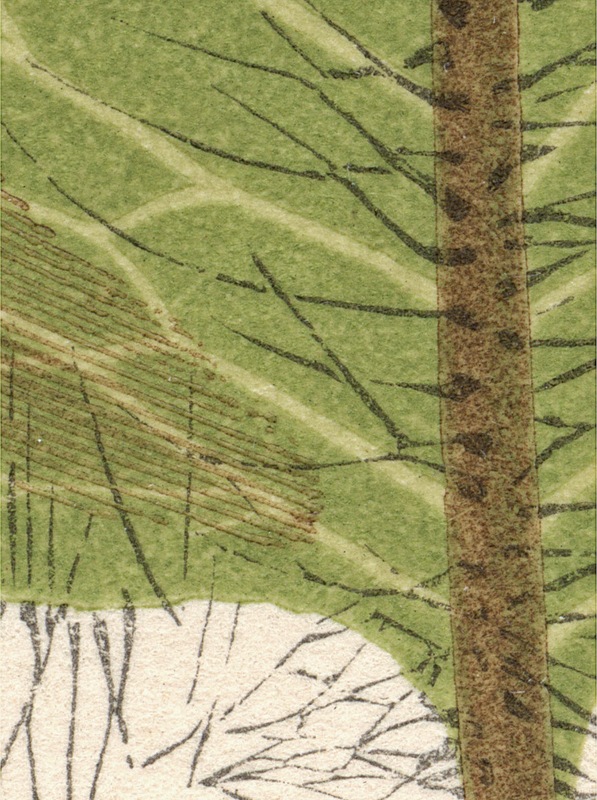 For the viewer this cropping implies that the leaves extend beyond the picture/plate area and as such the viewer is enticed into the active role of conceptually visualising—or to “picture in the mind’s eye”—more of the subject than is actually portrayed. 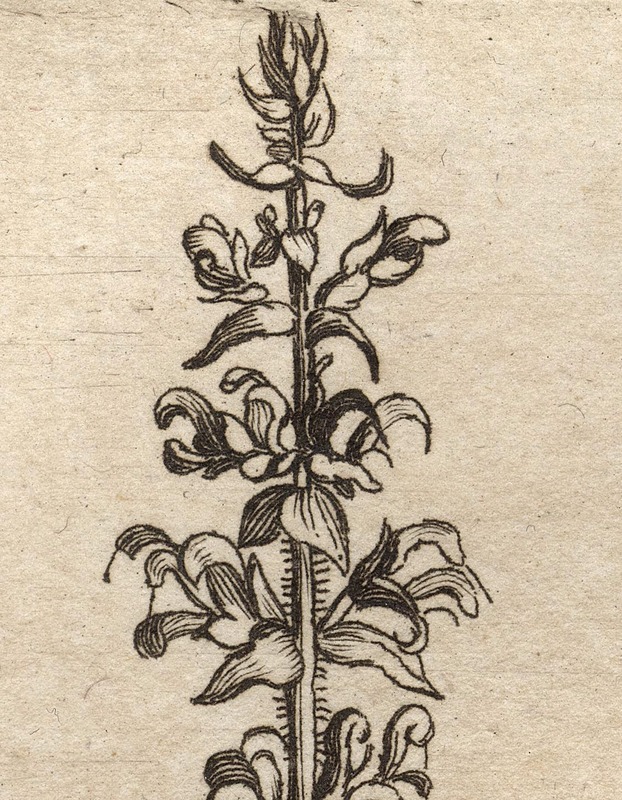 By contrast, the formatting of Hellebore-Leaved Calanthe presents the whole plant and casts the viewer into the more passive role of the subject's observer. Although the principle of cropping a subject at the format edge may seem trivial, it is important. It offers artists a simple way to catch the eye and excite the brain to start thinking about the subject presented. 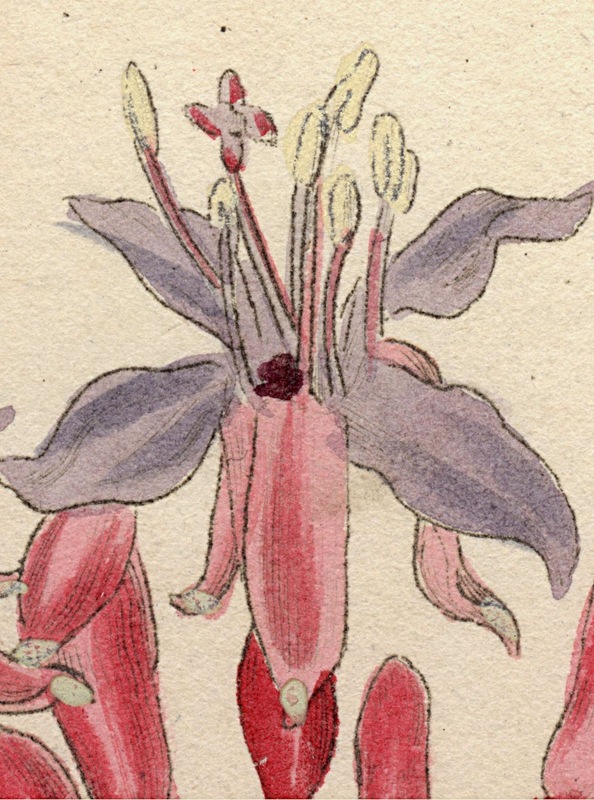 Perhaps pertinent to the question of whether to crop a subject or not is that the Weddell’s (1825) adaptation of Robert Kaye Greville’s original design for Fuchsia underwent a revision by Ernst von Reider’s for the publication, Blumen und Ziergewachse (1832) (see fourth image from the top of the page at http://www.nkvf.nl/Gelderse_Fuchsia_info-%20site/P16-eng.Antique_Botanical_Fuchsiaprints.htm [viewed 2 May 2014]). 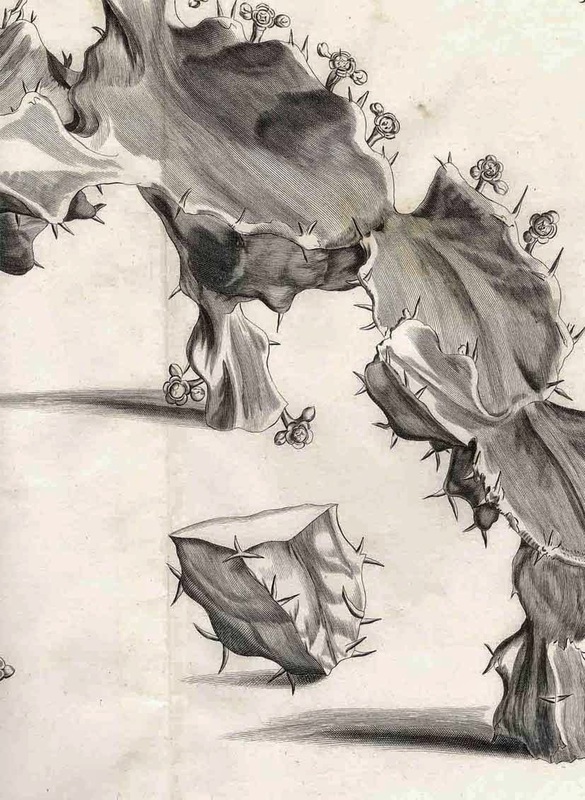 In this version of Greville’s design the leaves of the plant are not cropped but, to my eyes, the composition is awkward, squashed and exhibits artifice rather than life. 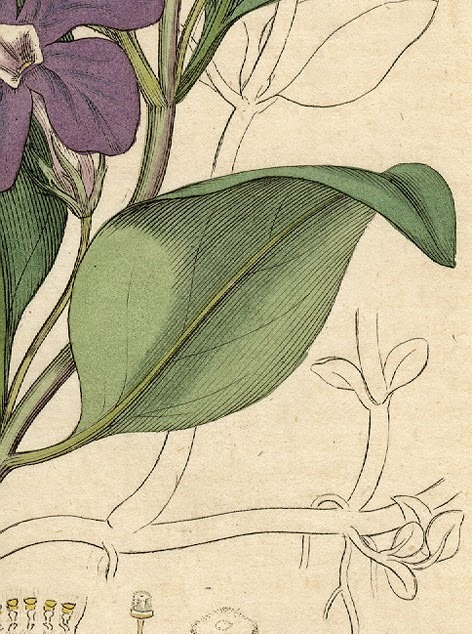 Of course, botanical illustrators are not obliged to use the principle of cropping. Moreover, use of the principle is not an essential way to catch a viewer’s attention with a vital spark. There are many other ways. 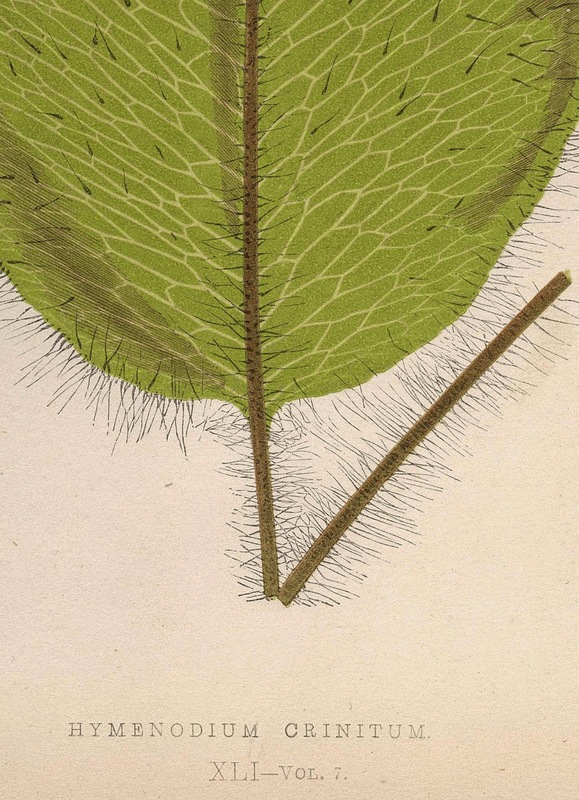 For instance, a perfect example of a print that clearly does not rely on the subject having been cropped and yet it is riveting to the eye is Edward Joseph Lowe's (1825–1900) Hymenodium Crinitum (shown below). 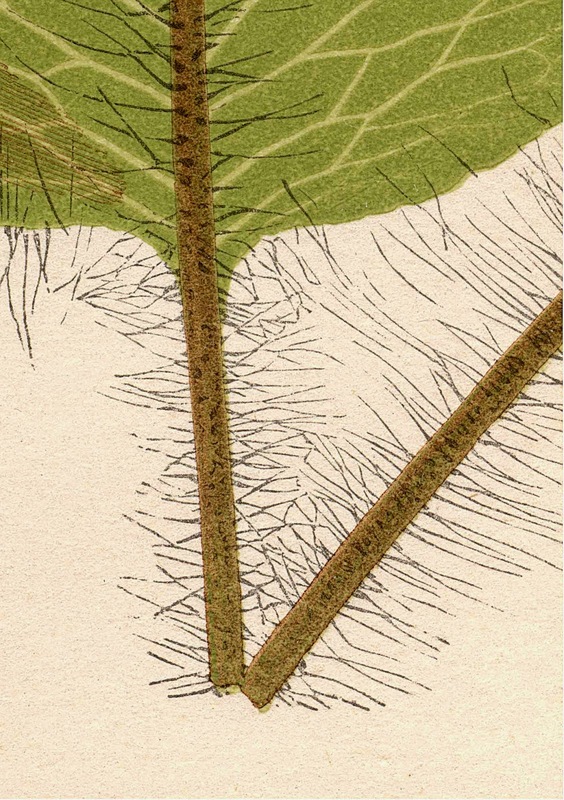 From a personal viewpoint this print catches my attention and it exudes an aura of presence for an antithetical reason to the cropped leaves of the Fuchsia engraving: in Hymenodium Crinitum the central placement of the subject—a leaf—is like the bullseye in a target in which the strong symmetry and the virtual sea of negative space surrounding it generates a commanding aura of presence for the subject. From Lowe's Ferns: British and Exotic, Vol 1 (Plate XLI), published 1856 by Groombridge and Sons, London. Condition: crisp impression with minor age-toning otherwise in good condition (i.e. the colour has not faded and there is no sign of foxing, bumps or tears). 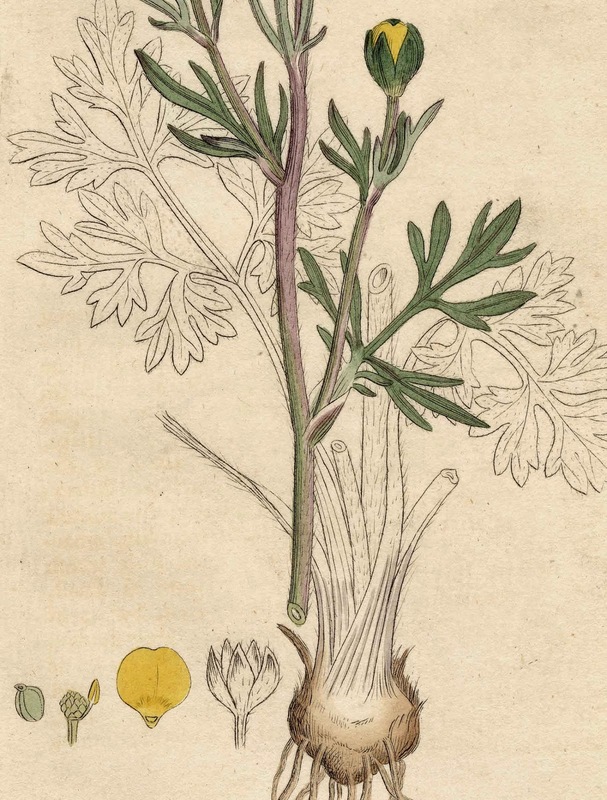 I am selling this print (Hymenodium Crinitum) and the print shown further (Horminum: Angurice Folio) for a total cost of $58 AUD including postage and handling to anywhere in the world. Please contact me using the email link at the top of the page if you have any queries or click the “Buy Now” button below. 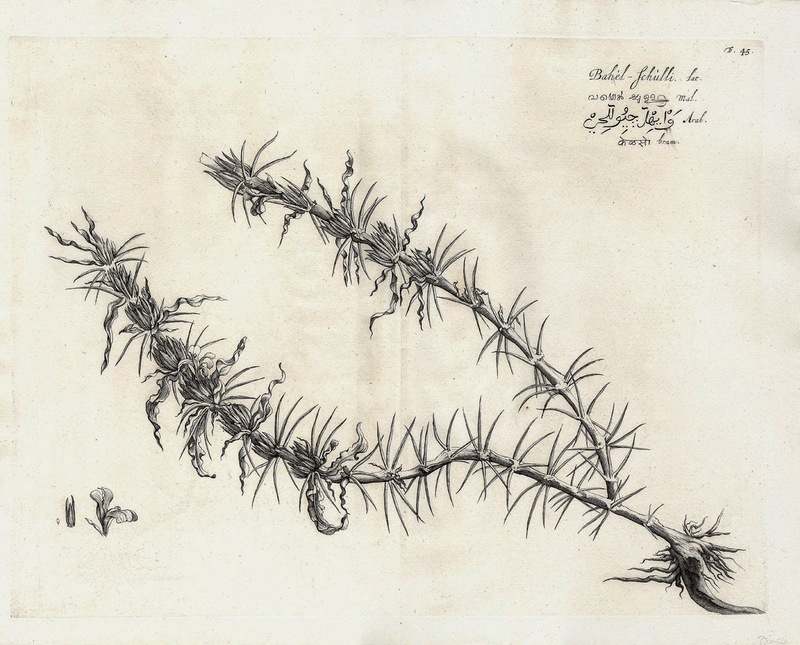 Equally riveting in terms of central placement is Paul Herman’s (1646–95) early botanical study, Horminum (shown below), where the plant’s stem creates an uninterrupted vertical line through the composition’s centre. 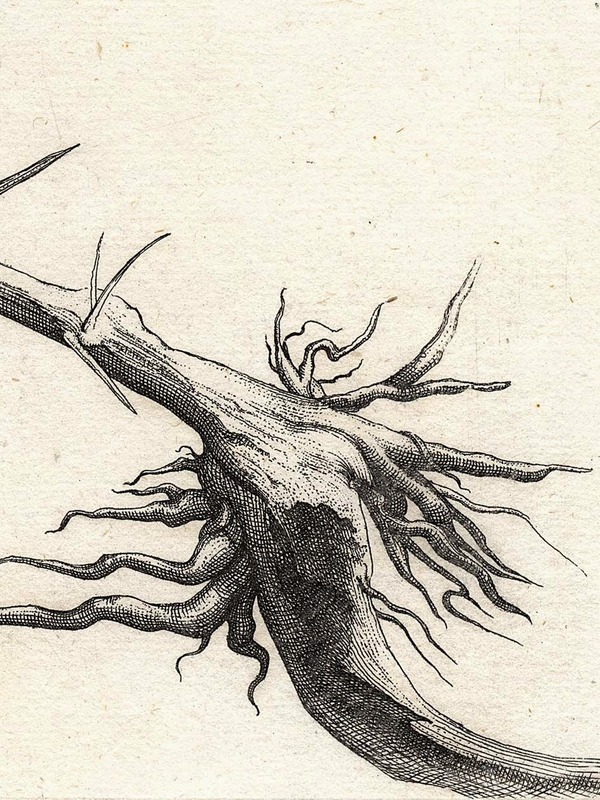 Unlike Lowe’s print, here the strong attraction to the centrally placed line of the stem is offset by the use of another principle/rule of composition that commands the eyes’ attention and, arguably, gives the subject vitality: use of tangents. 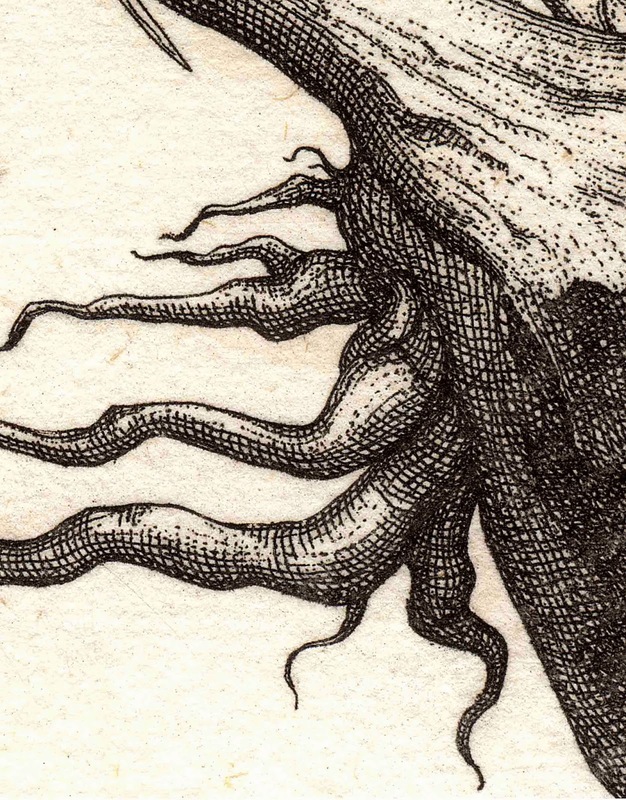 In Horminum these tangents occur where the extremities of the plant abut with (i.e. 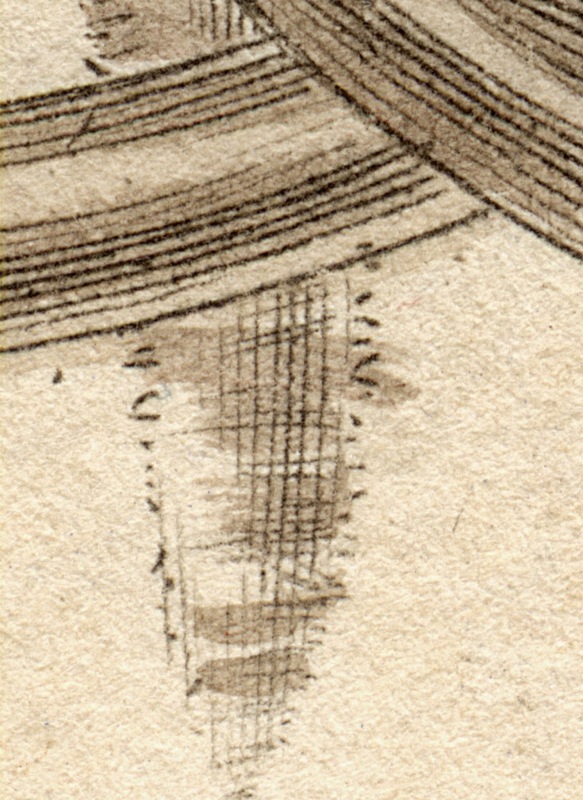 “brush against”) the sides of the plate marks. Interestingly, this principle/rule of composition is usually avoided (as discussed in the posts, Compositional Rules, Part 1 and 2) because tangents attract attention away from the centre of a composition. 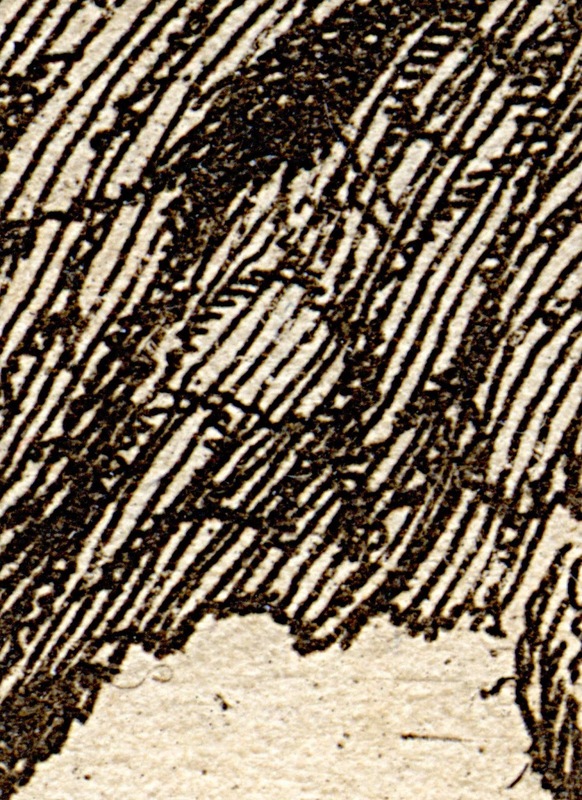 In this composition, however, creating interest at the peripheral edges of the format is not a problem as the centre is already asserting an overly strong attraction and the use tangents help to counteract and balance a viewer’s interest. Condition: strong, richly inked impression with appropriate age-toning towards the extremities of the sheet and light handling marks otherwise in good condition. 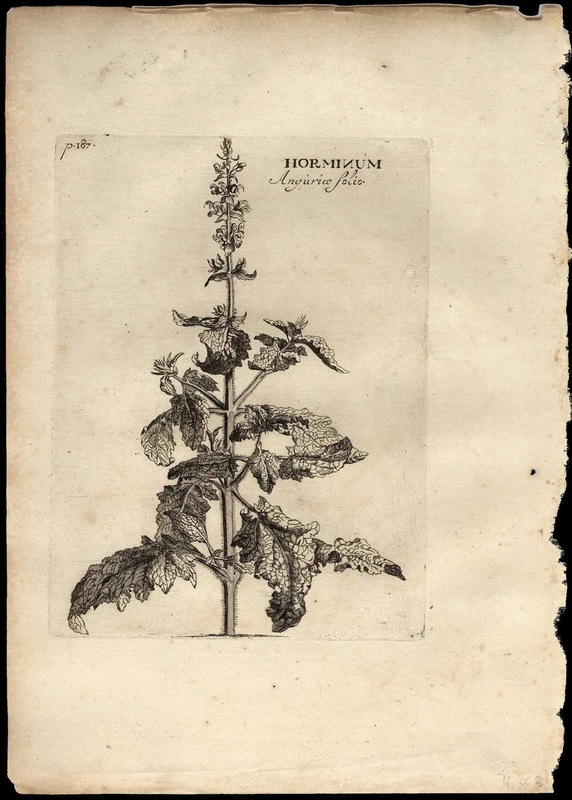 I am selling this print (Horminum: Angurice Folio) and the print shown further above (Hymenodium Crinitum) for a total cost of $58 AUD including postage and handling to anywhere in the world. Please contact me using the email link at the top of the page if you have any queries or click the “Buy Now” button above. 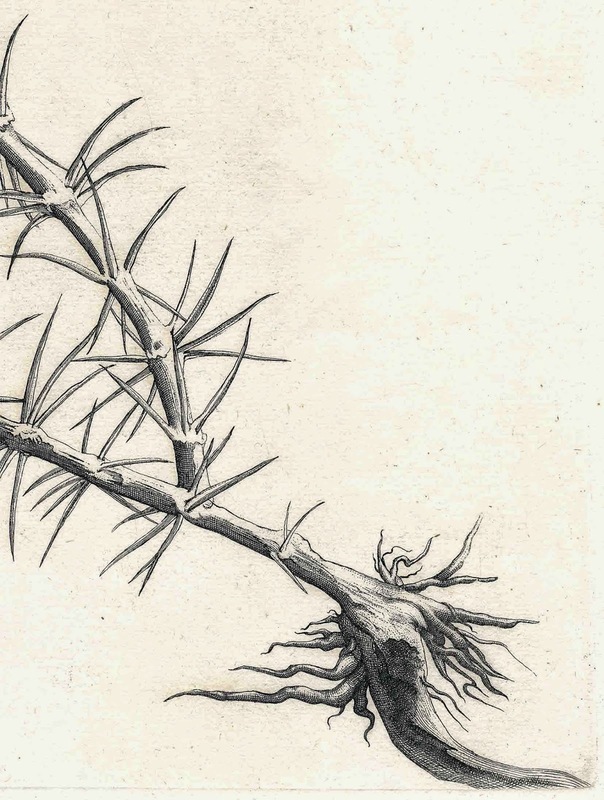 Regarding the second dot-point about making illustrations memorable—the need to sustain a viewer’s interest—I wish to compare two rare engravings from Hendrik van Rheede tot Drakenstein’s (1636–91) famous, Hortus Indicus Malabaricus that offers insights into Dutch colonial botanical interests in South Asia: Schadida-calli and Bahel schulli (both shown below). Condition: extremely rare, richly inked and crisp impression in near pristine condition. 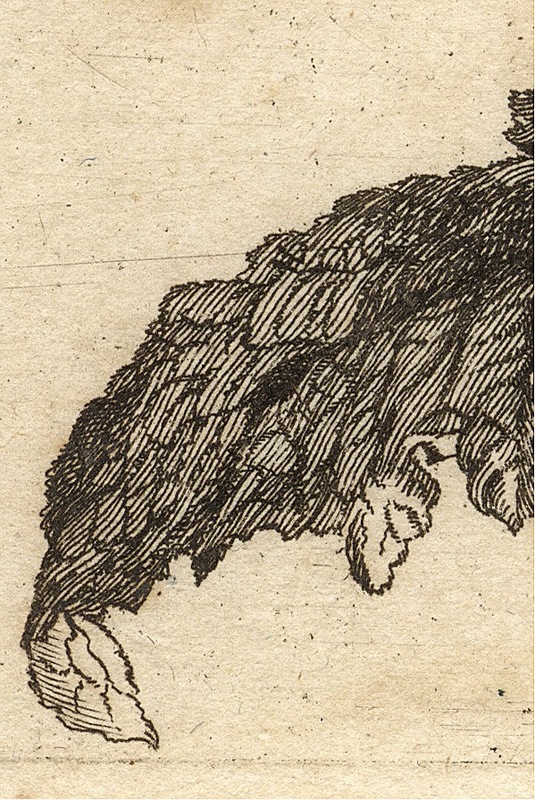 I am selling this print (Schadida-calli) and the related print shown further above (Bahel schulli ) (i.e. two engravings) for a total cost of $176 AUD including postage and handling to anywhere in the world. Please contact me using the email link at the top of the page if you have any queries or click the “Buy Now” button below. Condition: rare and superb impression in near pristine condition. 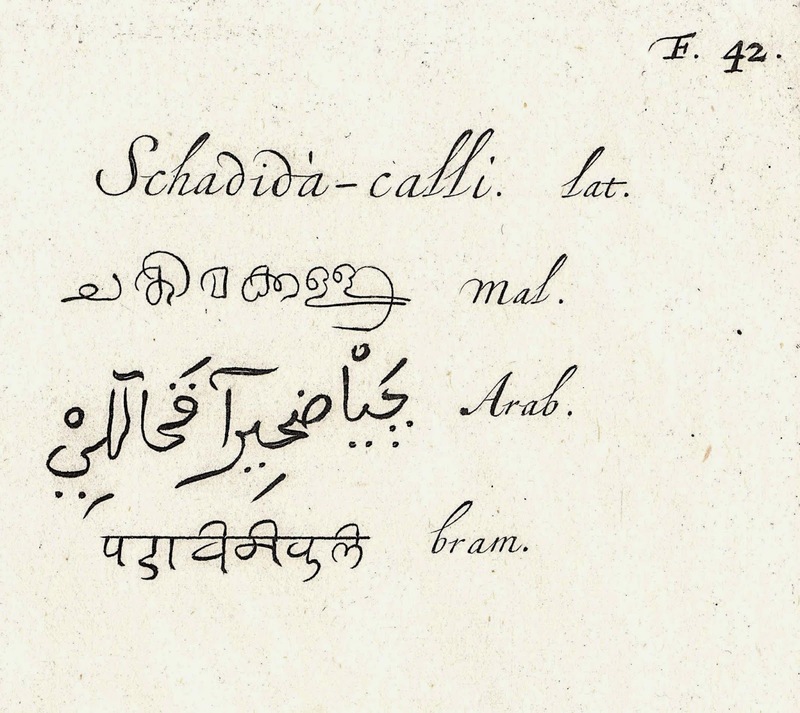 I am selling this print (Bahel schulli ) and the related print shown further above (Schadida-calli) (i.e. two engravings) for a total cost of $176 AUD including postage and handling to anywhere in the world. Please contact me using the email link at the top of the page if you have any queries or click the “Buy Now” button above. 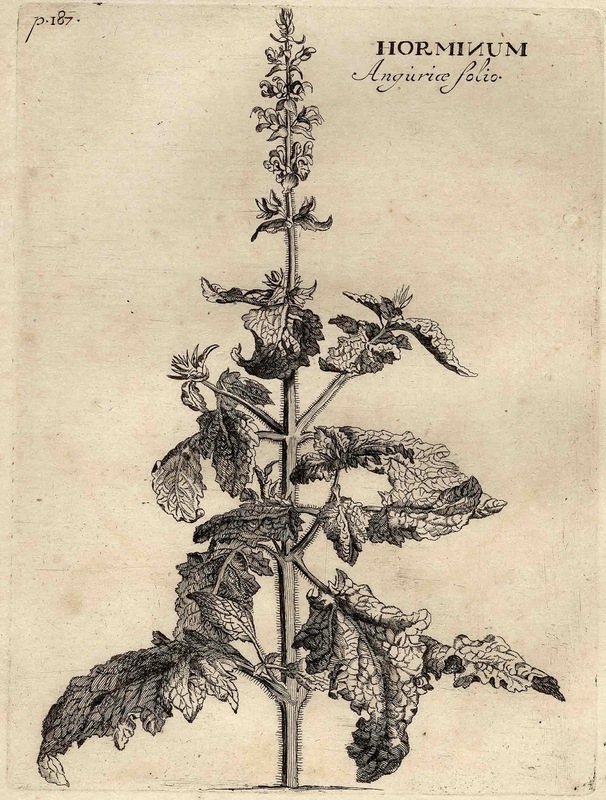 From personal experience of looking at prints such as these, I have found that images which actively invite my gaze are more likely to succeed in sustaining interest and projecting the idea that a plant is alive. Fortunately the principle that performs this task the best is not a well kept secret. It is simply the use of projection. In practice this means ensuring that the portrayed subject has features that pictorially jut out towards the viewer and/or features that recede away. 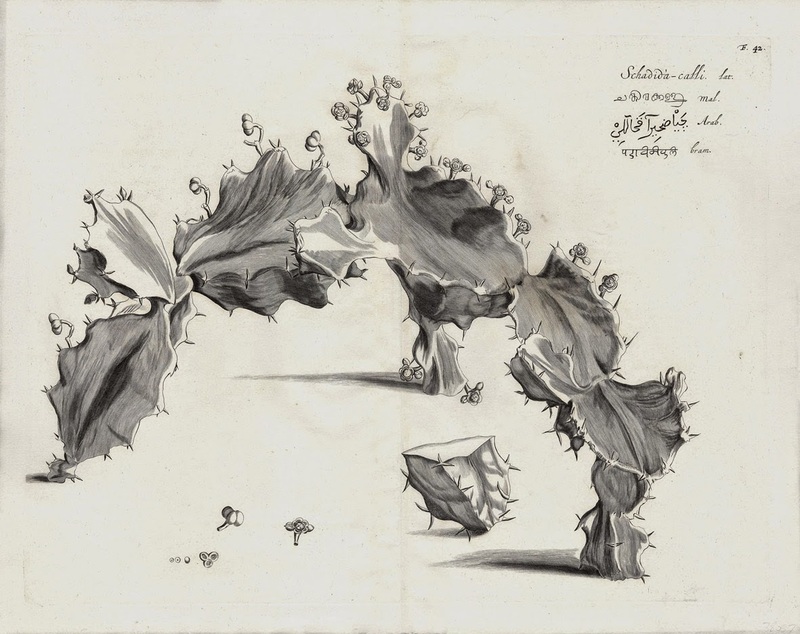 To illustrate the use of projection, note how the cactus depicted in Schadida-calli arcs towards the viewer or, for some viewers that read the image differently, the cactus arcs away. 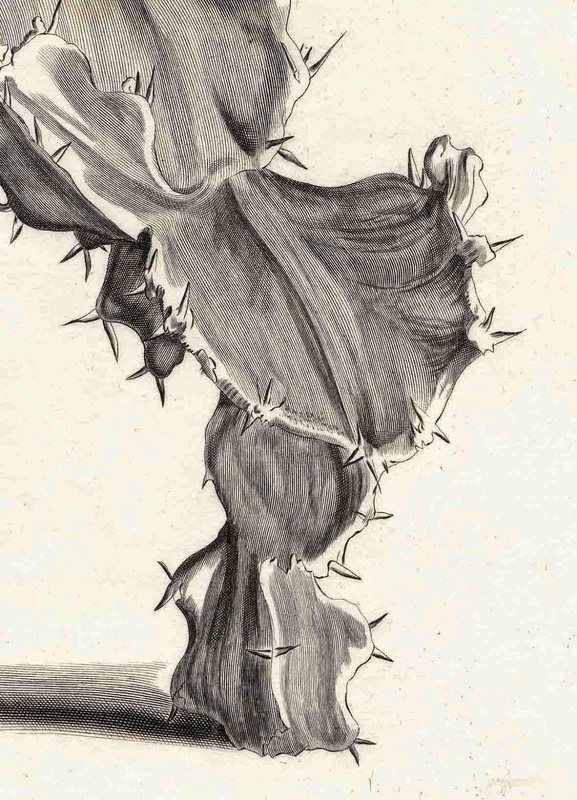 This angled arrangement of the cactus acts like a conceptual bridge in welcoming a viewer to look into the pictorial space of the image. 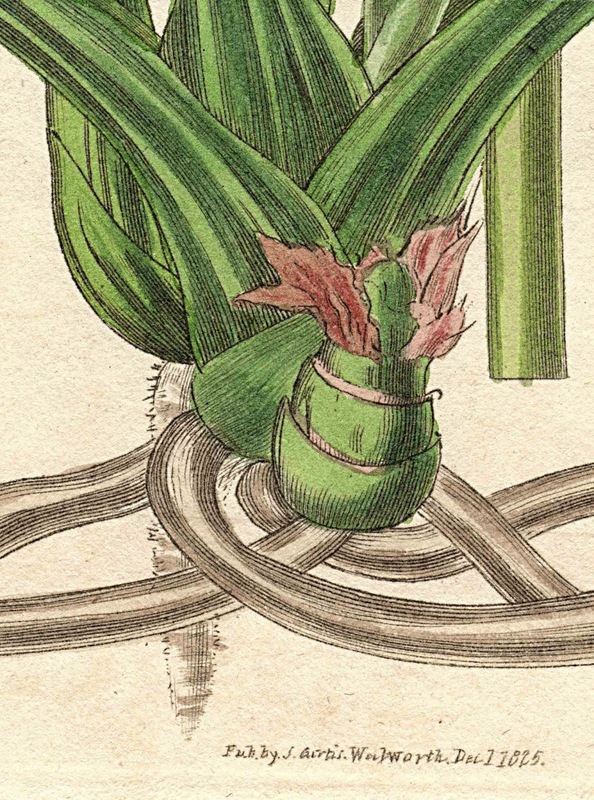 With regard to whether the use of projection also breathes life into the cactus is best answered by comparing the projecting arrangement of the cactus in Schadida-calli with the non-projecting arrangement of the marsh herb in Bahel schulli where the plant is arranged parallel to the viewing plane. 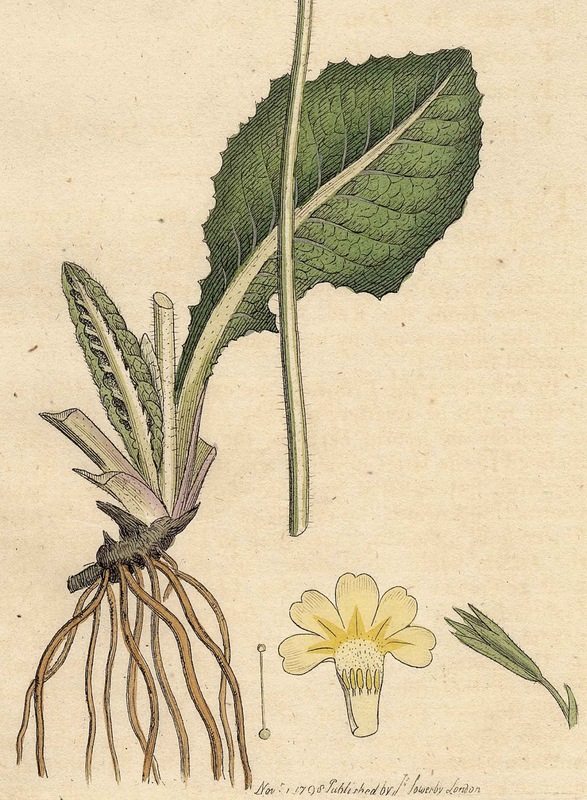 For me, the herb seems lifeless because I examined it passively whereas subjects like the cactus that are angled towards me seem to arouse a feeling that I need to interact with them and in the process this active engagement lends the suggestion that they are alive. 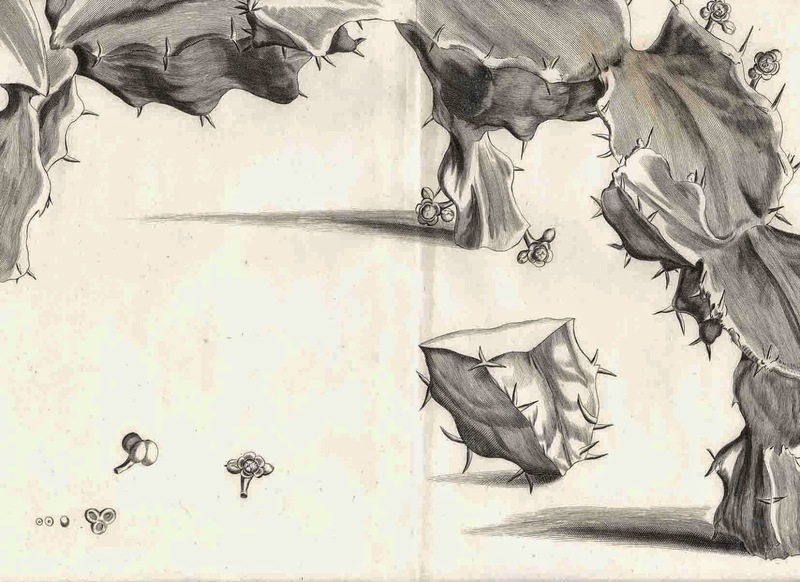 Regarding the third and final dot-point—to communicate meaning through visual relationships within the image—this is a critical strategy in botanical illustration. 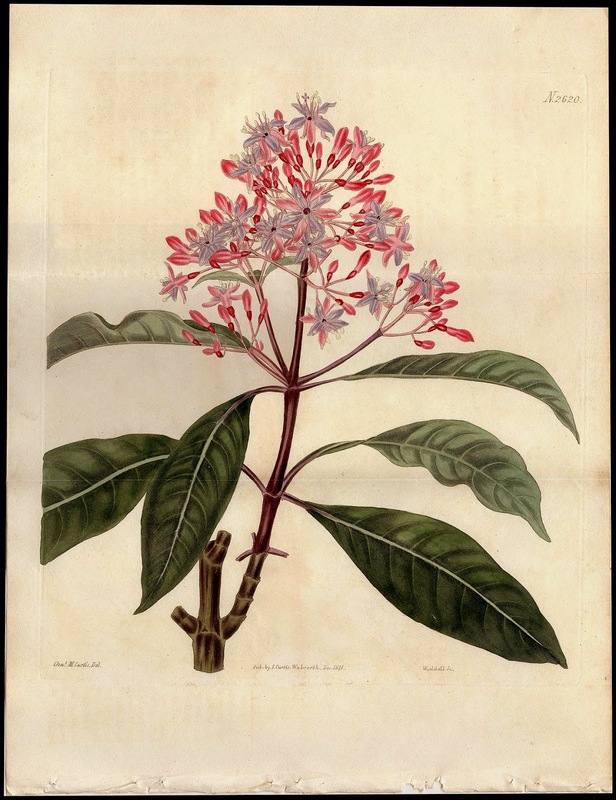 After all, without clear and unambiguous communication, an image is unlikely to be a meaningful showcase repository of botanical information and the image is also unlikely to be memorable. 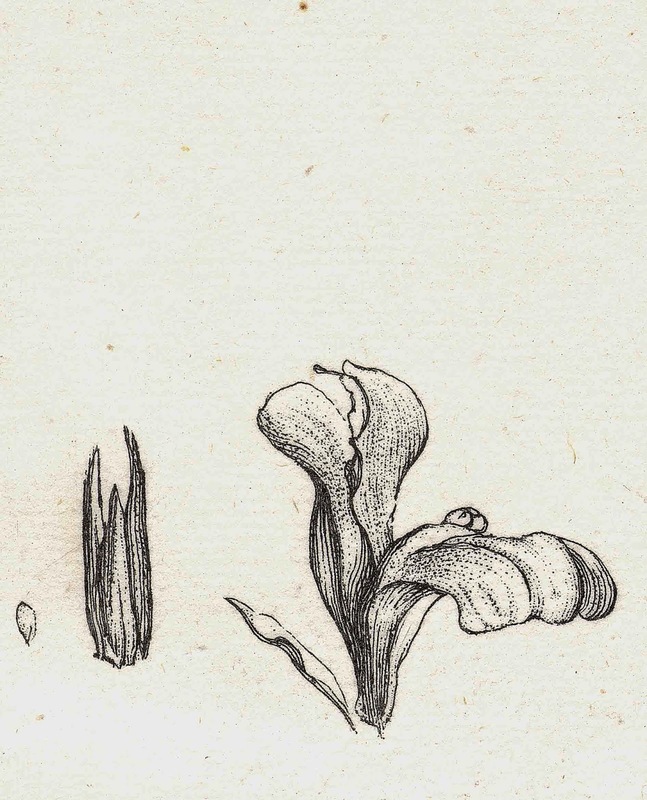 To illustrate how an artist can communicate key attributes of a plant with clarity, I wish to focus on the compositional arrangement of six engravings (shown below) from the eighth volume of James Sowerby’s (1757–1822) justifiably famous English Botany. 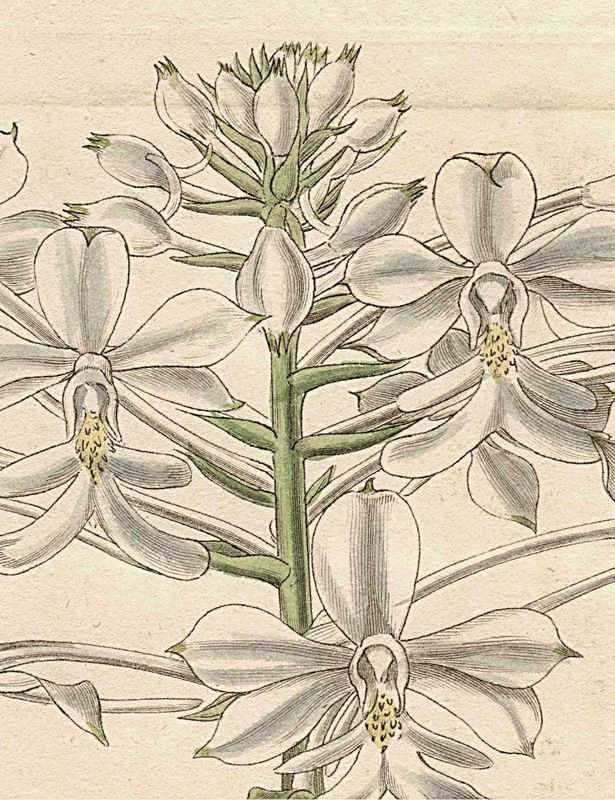 6 original engravings with hand-colouring as published in the 1799 (first) edition of English Botany; or, Coloured Figures of British Plants, with their Essential Characters, Synonyms, and Places of Growth, Volume 8, with accompanying text page descriptions of each plant. 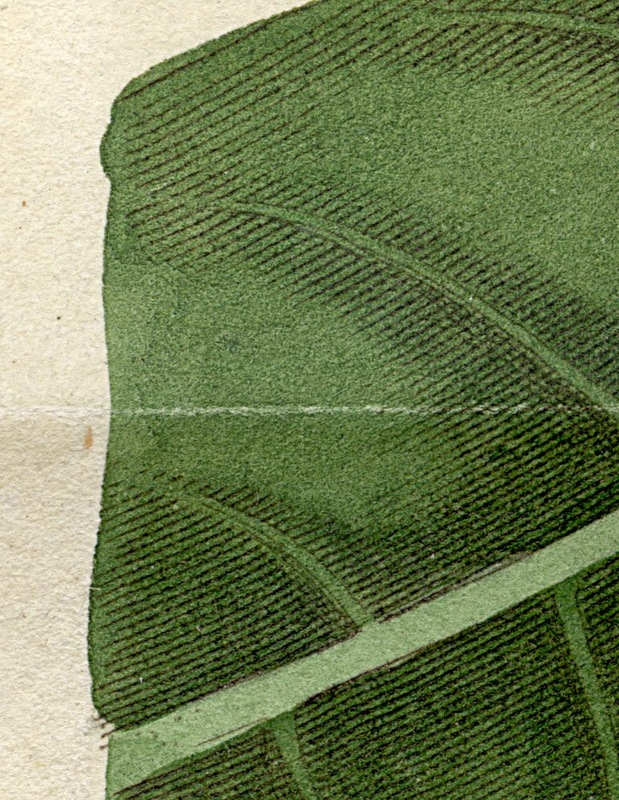 Condition: crisp impressions with hand-colouring (as published in 1799) in pristine condition. The pages are taken from a book that is in poor condition hence the pages are loose. I am selling all 6 prints with their accompanying page of descriptive text for a total cost (including shipping to anywhere in the world) of $100 AUD. Please contact me using the email link at the top of the page if you have any questions or click the “Buy Now” button below. 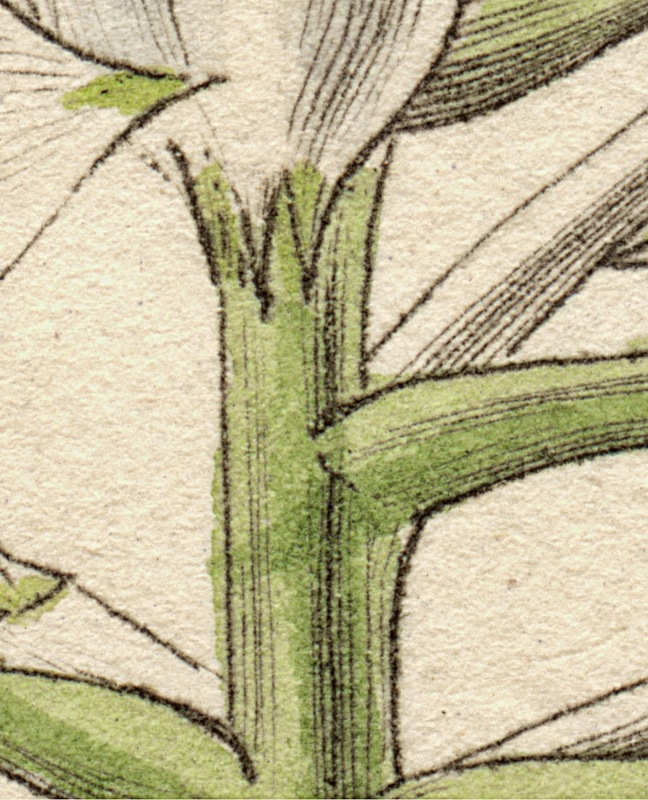 a large section of each plant is portrayed in full-colour while smaller details of the plant are rendered schematically in black line. 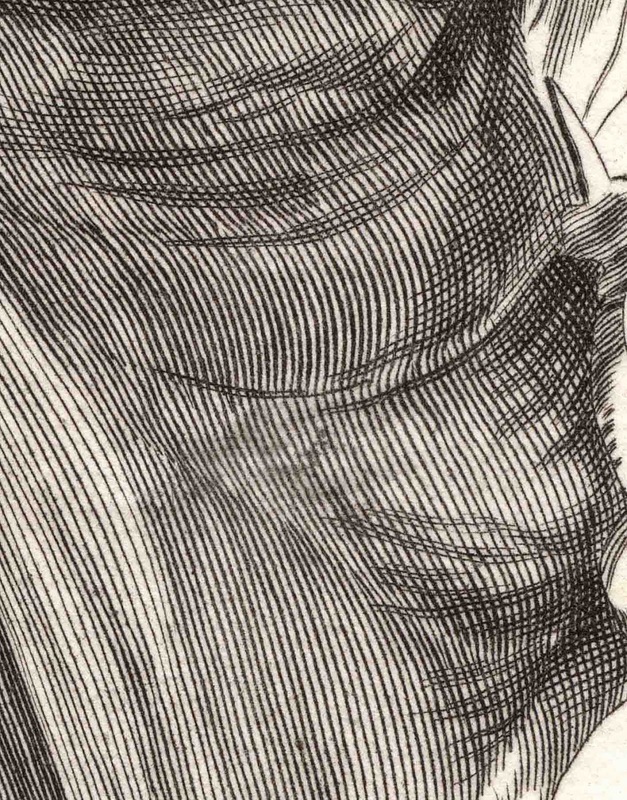 Sowerby’s choice to arrange his prints in this way is far from accidental. 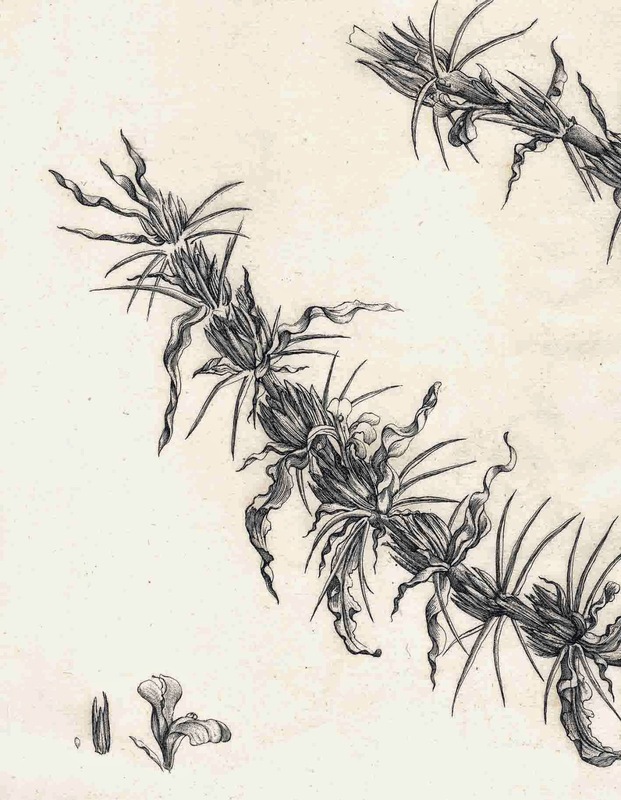 By design, the composition of his prints is all about providing botanists with accurate visual information about the distinctive features of each plant. 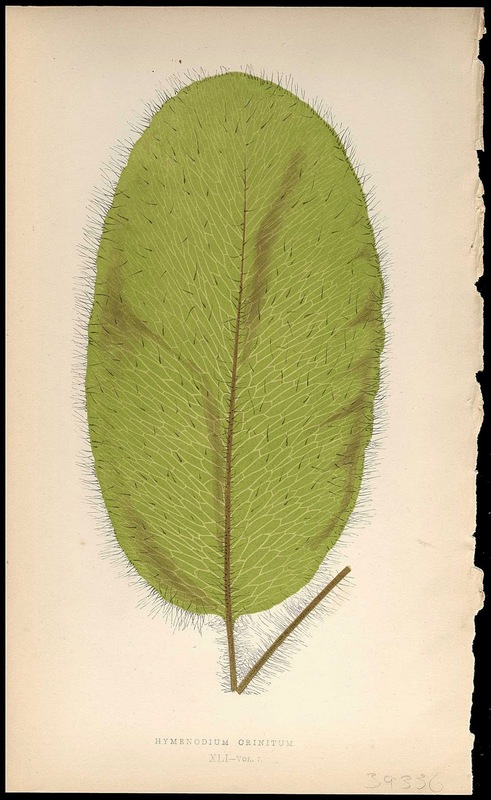 With regard to a particular specimen’s leaf-shape, for instance, Sowerby applies the principle of juxtaposition wherein two related pieces of visual information are juxtaposed to clarify the distinctive characteristics of a leaf’s shape. 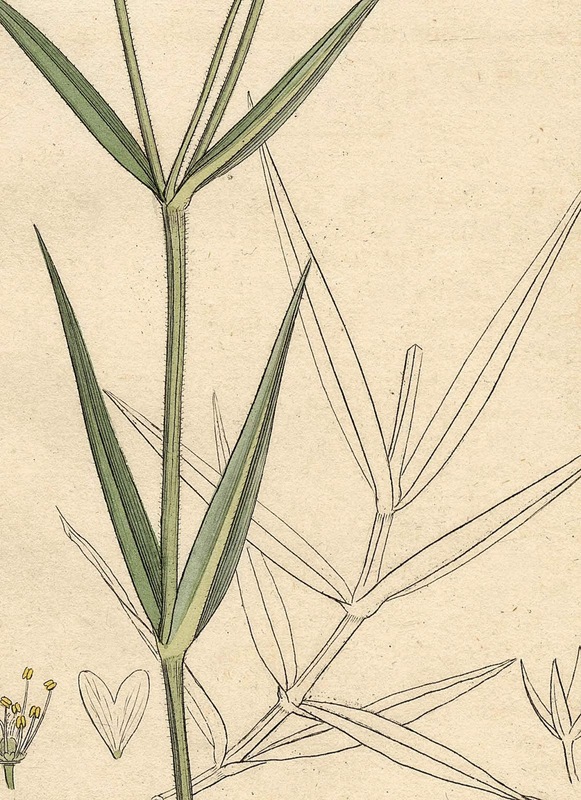 In Greater Stitchwort (shown as the top-left image in the panel of six prints and the first detail), Sowerby offers a full-colour overview of the Greater Stitchwort’s leaves and how they are attached to their stem; this is the first piece of visual information. 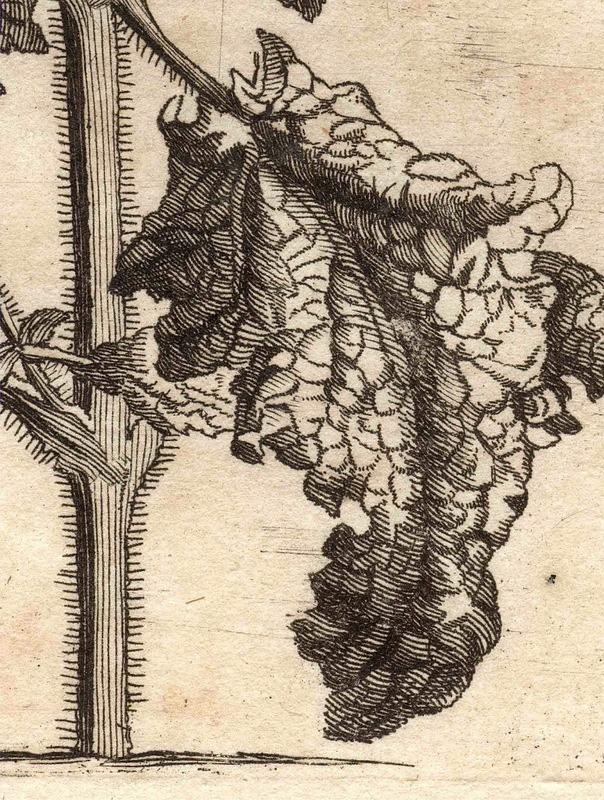 To ensure that a botanist is unlikely to make an error in reading the lanceolate shape of the leaves and how they are attached, Sowerby offers an outline drawing of the leaf and stem arrangement; this is the second piece of visual information. 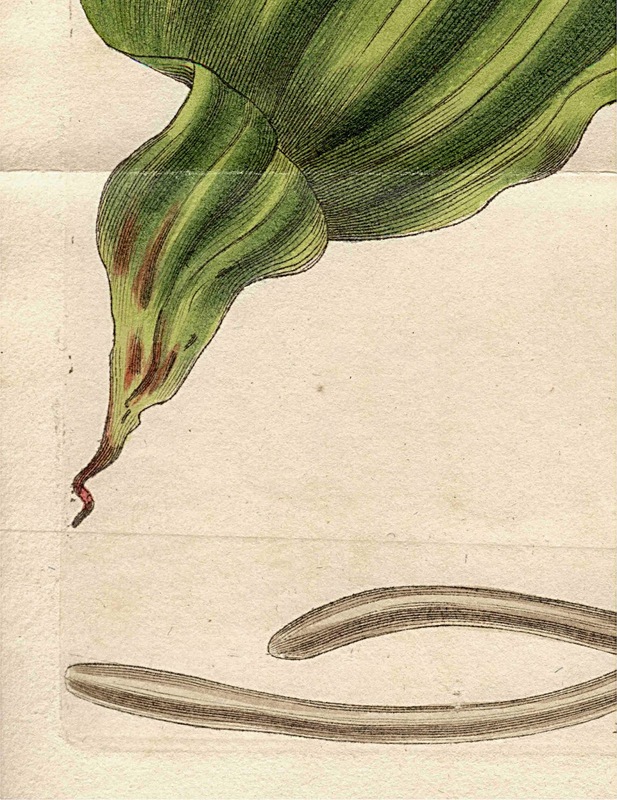 By intention, both these juxtaposed pieces of information are correlated by the botanist’s eye so that a very clear picture of the leaf-shape is understood.